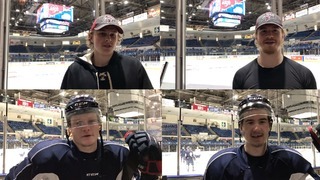 Toronto, ON – The Ontario Hockey League today announced the Top OHL Performers of the Month for regular season games played in December 2018, including Ottawa 67’s forward Tye Felhaber, Saginaw Spirit defenceman Bode Wilde, Sudbury Wolves goaltender Ukko-Pekka Luukkonen and Sarnia Sting rookie Jacob Perreault. 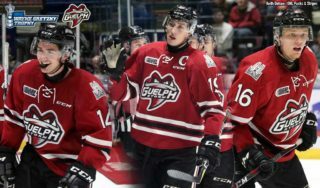 Ottawa 67’s overage winger Tye Felhaber is the OHL Player of the Month for December after leading the league with 16 goals and 20 points over 10 games along with a plus/minus rating of plus-10. The fifth-year forward had points in all 10 of his December contests, recording three different hat-tricks while earning Three Star recognition on five separate occasions. Felhaber got his month started with a bang on Dec. 2nd, scoring three times in a 6-3 win over the North Bay Battalion. 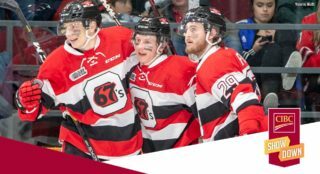 He recorded another hat-trick a week later, powering the 67’s past the QMJHL’s Gatineau Olympiques 5-1 on home ice before following-up that effort with two goals and an assist on Dec. 9th as the 67’s defeated the Peterborough Petes 4-2. Felhaber rounded out the 2018 calendar year with a New Year’s Eve third period hat-trick as the Barber Poles fell 6-5 in Niagara. 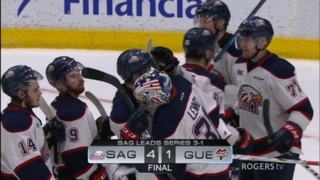 The hat-trick was the sixth of Felhaber’s OHL career, bringing his goal-scoring total to a league-leading 42 on the campaign. A 20-year-old product of Pembroke, Ont., Felhaber sits second in OHL scoring with 63 points (42-21–63) over 38 games. His plus-33 plus/minus rating leads the OHL and he’s currently in the midst of a 12-game point streak that dates back to Nov. 24th. 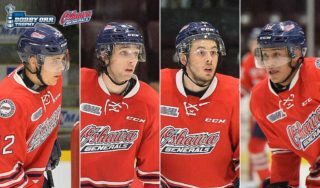 A former first round pick by the Saginaw Spirit in the 2014 OHL Priority Selection, Felhaber has racked up 239 points (128-111–239) over his 281 career regular season contests between Saginaw and Ottawa. His 42 goals this season are the most by a 67’s player since Tyler Toffoli (52) and Shane Prince (43) surpassed the mark back in 2011-12. New York Islanders prospect Bode Wilde of the Saginaw Spirit is the OHL Defenceman of the Month for December, leading all blueliners with 16 points including four goals and 12 assists over 10 games. Wilde recorded at least a point in nine of his 10 December contests, registering a career-high four points with a goal and three assists in a 7-3 Spirit victory over visiting Sarnia on Dec. 15th. Wilde put up five different multi-point efforts as the Spirit pulled to within three points of first place in the West Division with a 7-2-1-0 record in December. He wrapped up 2018 on a six-game point streak, recording at least one in 10 of his last 11 games. An 18-year-old native of Plymouth, Mich., Wilde sits third among OHL defencemen with 37 points (9-28–37) over 30 games in this, his first OHL season. Saginaw’s second round pick in the 2016 OHL Priority Selection, Wilde joined the Spirit following two seasons with the U.S. National Development Program. He has represented the United States at both the 2016 World Under-17 Hockey Challenge and the 2017 IIHF World Under-18 Hockey Championship and was New York’s second round (41st overall) pick in the 2018 NHL Draft. Sixteen-year-old Sarnia Sting forward Jacob Perreault is the OHL’s Rookie of the Month for December after recording 17 points including nine goals and eight assists over 10 games. Perreault had points in nine of his 10 outings including five multi-point performances as the high-scoring Sting remained in the thick of things in the West Division. Perreault put together three straight two-point showings on Dec. 6th, 7th and 8th, starting the weekend with two goals in a 5-4 overtime road win over Windsor. He put up three points on Dec. 14th with two goals and an assist as Sarnia trounced visiting Erie 10-4. Perreault registered a season-high four points with two goals and two assists in a first star showing as part of a 7-3 win over visiting Owen Sound on Dec. 28th. He earned Three Star recognition five different times over the course of the month. A 16-year-old product of Hinsdale, Ill., Perreault leads OHL rookies with 19 goals and 35 points over 33 games this season. The son of former NHL centreman Yanic Perreault has points in 10 of his last 11 games and currently leads the Sting with a plus/minus rating of plus-10 this season. The 19th overall pick of the 2018 OHL Priority Selection from the Chicago Mission U16 program, Perreault will be eligible for the NHL Draft in 2020. Buffalo Sabres prospect Ukko-Pekka Luukkonen of the Sudbury Wolves is the Vaughn OHL Goaltender of the Month for December after playing to a perfect 5-0 record with a 1.97 goals-against average, .937 save percentage and one shutout. 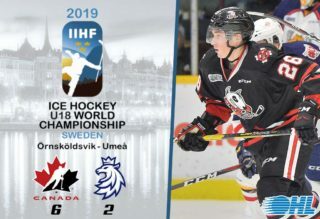 The 6-foot-5, 214Ib Luukkonen extended his winning streak to eight games before departing to British Columbia where he’s representing his native Finland at the 2019 IIHF World Junior Hockey Championship. He started the month of December with his second shutout of the season, making 28 saves in a 7-0 blanking of the Mississauga Steelheads on Dec. 2nd. He turned in another 28-save performance on Dec. 7th as the Wolves defeated the visiting Barrie Colts 5-1. Luukkonen closed out his December with a 27-save effort as the Wolves defeated the visiting Kitchener Rangers 5-2 on Dec. 14th. A 19-year-old native of Espoo, Finland, Luukkonen owns a 19-5-1-1 record with a 2.49 goals-against average and .923 save percentage over 26 games in this, his first OHL season. The third overall pick of the 2018 CHL Import Draft has also stopped 13 of the 16 shootout opponents he has faced this season and helped the Wolves rise to as high as first in the Central Division in recent weeks. Luukkonen was Buffalo’s second round (54th overall) pick in the 2017 NHL Draft. He’s currently representing Finland at the World Juniors for the second straight year.